Thekchen Chöling, Dharamsala, HP, India. March 12, 2018 – The Tsuglagkhang, the Main Tibetan Temple, adjacent to His Holiness the Dalai Lama’s residence was the location this morning for the opening of a Mind & Life Conference focussing on ‘Reimagining Human Flourishing’. Participants, presenters and moderators are seated around a large low table set laterally across the main body of the temple. They are flanked by guests and interested observers, 100 from the Mind & Life side and another 200, many of them scholarly monks and nuns, invited by the Dalai Lama Trust. When His Holiness arrived he greeted several old friends before taking his seat at the head of the table. Susan Bauer-Wu, President of the Mind & Life Institute, began by welcoming everyone present to this Mind & Life Dialogue, the 33rd altogether and the 13th in Dharamsala. She expressed gratitude to His Holiness, the Dalai Lama Trust and the Hershey Family Foundation for their support in making it possible. In the 26th year of its existence she reiterated the Mind & Life Institute’s aim of working to eliminate suffering and promote human flourishing. On this occasion the intention is to delve again into how to give young people a good education that takes account of secular ethics, attention and compassion, love and forgiveness—an education of the heart, bearing in mind the evidence that compassion can be taught. She closed her introduction by presenting His Holiness with a copy of a new book, ‘The Monastery and The Microscope’, a record of the dialogue that took place in Mundgod in 2013. This morning’s moderator Kimberley Schonert-Reichl introduced the first speaker, Richard Davidson. He started by thanking His Holiness for his time and inspiration and went on to present a brief historical context for the current meeting. He cited five previous meetings as having a pivotal bearing on this one. The first was the 5th Mind & Life dialogue held in 1995 in Dharamsala, at which altruism, ethics and compassion were discussed. Next was the 8th Dialogue, also in Dharamsala, that dealt with d estructive emotions and led to Dan Goleman’s writing a book that catalysed public focus on them. At this pivotal point, Davidson reported, His Holiness advised the members of the Mind & Life Institute to investigate practical ways to cultivate a virtuous mind and counter destructive emotions. The third key meeting on ‘Investigating the Mind’ took place at MIT. It was pivotal again because it was the first public meeting to raise questions about the mind and destructive emotions in a mainstream scientific context. The prestigious scientific journal Nature reported it and so brought the mission of Mind & Life to the attention of the world. The fourth key meeting, focussed on Neuroplasticity, revealed that training the mind can change the brain, while the fifth, in Washington, DC, focussed on educating world citizens. Having reviewed the topics that will be discussed during the course of this conference, Davidson began his own presentation under today’s theme of Early Childhood Development and Social and Emotional Learning. He mentioned neuroplasticity, the role of genetics, sensitive periods and innate basic goodness in early childhood development. He talked about early synaptic overproduction, cortex pruning and prefrontal pruning in the context of a timeline of brain development. Some developments can lead to vulnerability, while others lead to resilience. He also made reference to sensitive periods in childhood development, such as birth, starting school and adolescence. 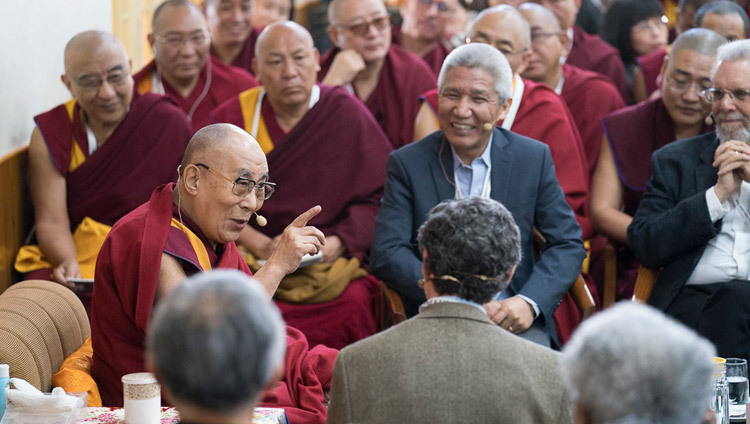 In the context of thoughts associated with changes in the brain, His Holiness wanted to know, if someone is physically at ease, which comes first the thought or the change in the brain. Davidson replied that many scientists say thought and brain activity co-occur, remarking that this relates to the relation between mind and brain about which he considers little scientific progress has been made for 100 years. This prompted His Holiness to reflect on the purpose of his meetings with scientists. “One purpose is to extend our knowledge. Several decades of experience have shown that ancient Indian understanding of the workings of the mind derives from practices to cultivate single-pointedness and analysis—shamatha and vipashyana. It involves knowledge of how to transform emotions that remains relevant today. On the other hand, science presents a challenge to traditional Indian cosmology, which has resulted in my publicly rejecting belief in Mt Meru as the centre of the universe. “However, since science is only beginning to investigate the mind, I believe ancient Indian knowledge has a contribution to make and that it is important to bring these traditions together. In 1979, when I held discussions with scientists in Moscow, they were happy to acknowledge five sensory consciousnesses, but dismissed mental consciousness as only of religious concern. “The second purpose of these meetings relates to the crisis of emotions we witness in the world today, which is manifest in the contrast between the peace we enjoy together here and the anguish experienced in other parts of the world where people are being killed or dying of starvation. We need to show more concern for others’ well-being. We need a greater sense of the oneness of all human beings, the sense that we all belong to one community. We need to promote warm-heartedness. Religion can contribute to this, but sometimes religion leads to greater divisions. In such a context, scientists’ finding evidence that basic human nature is compassionate is a source of hope. “That basic human nature can give rise to self-confidence, trust and transparency. It allows us to smile. Viewing others with suspicion is not a way to be happy. The one billion of seven billion people alive today who have no interest in religion are still human beings. We and they need a secular approach to creating a more peaceful, joyful world. Science shows us, for example, that warm-heartedness is good for our physical health. “The time has come to think in terms of the whole of humanity not just our nation within its own boundaries. The environment too is telling us that we human beings have to work together as one community, which is the only way we’ll meet such serious issues as the increasing shortage of water. It will require a new approach to education that takes account of scientific findings and that cultivates human qualities on the basis of a secular scientific approach. “This world with its human population may last another few thousand years, but we have to encourage the next generation to do things differently. I’m nearly 83, so I don’t have that much time left and when I’m gone I may go to heaven, if there is one. But I may be reborn on this planet since I pray to abide to dispel the misery of the world for as long as space endures and as long as living beings remain. Richard Davidson concluded his presentation noting an increase in depression and suicide among children and young people. He remarked that leading scientists are beginning to acknowledge the potential contribution ancient Indian understanding of the workings of the mind can make. After a fifteen minute break for tea Michel Boivin spoke about studies in child development, especially the investigation of the way twins develop. With regard to whether nature or nurture has greater influence in child development he quoted another expert in field asking which is more important to a rectangle, the width or the length. Dan Goleman considered social and emotional learning in the context of reimagining human flourishing. He spoke of teaching young children to think about what would make a given situation better and what would make it worse. He reminded His Holiness that his friend Paul Ekman had commented that maturity is about widening the gap between impulse and taking action. Amongst social and emotional learning’s advantages are that it leads to greater self-awareness and self-management skills, as well as responsible ethical decision making. 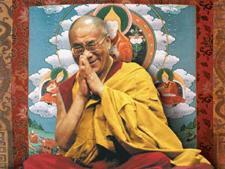 His Holiness remarked that the mind can change and that children are susceptible to being taught to analyse. He noted the ancient Indian approach that reading or listening to an explanation is not enough. You have to think about it to really understand it. And having understood something you have make yourself really familiar with it in order to embody that understanding.